So this AT&T attempt to purchase T-Mobile has really irked Sprint’s CEO, Dan Hesse. Hesse has aired his issues with the merge and explaining that it is bad for consumers and bad for business. Well, in an effort to not fall behind and gain customers, Sprint will begin to give business customers who switch over to Sprint a $175 credit and individuals up to $125 in credits. Not only that, but if the T-Mobile acquisition falls through, the customer can return to T-Mobile with no termination fee. 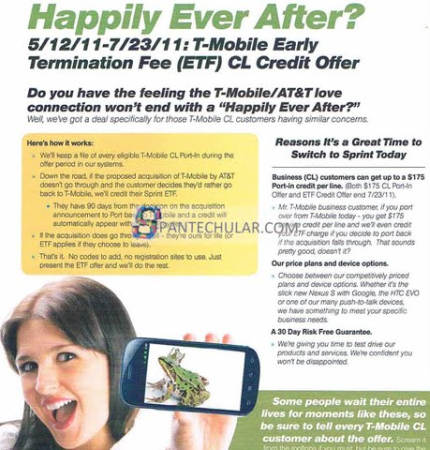 The flyer above is an internal document that was leaked from inside Sprint. It claims that the promotion started on May 12 and goes through July 23.